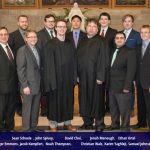 The Commencement Service for Bethany Lutheran Theological Seminary, which included both the assignment of calls and graduation of students, occurred on Wednesday, May 9, 2018 at 3:00 p.m. in Trinity Chapel. The Rev. David Thompson served as preacher, Pres. Gaylin Schmeling served as liturgist, the Rev. Herbert Huhnerkoch represented the Board of Regents, and Mr. John Baumann was the organist. The sermon was based on Hebrews 12:1–3 with the theme “The Joy and Cross of Christ.” In the sermon, Pastor Thompson spoke of the crosses through which the called servant is driven to the means of grace, Word and Sacrament. These means of grace strengthen one to carry out the Lord’s ministry. Then Pastor Thompson pointed out the wonderful joy of the ministry, offering comfort for this life and hope for the life to come. At the seminary commencement service, Dr. Michael Smith was honored for his sixteen years of service at the seminary. He has accepted a call to teach at Asia Lutheran Seminary, Hong Kong. Dr. Smith has distinguished himself as a New Testament professor and has received his Ph.D. in biblical studies. He has taught the Greek New Testament classes at Bethany Lutheran College, the New Testament courses at the seminary, and has served as guest lecturer in international seminaries of our fellowship. We thank the Lord for the wonderful blessings He has bestowed upon our seminary through Dr. Smith. Graduates from the seminary with a Master of Divinity degree were Noah Thompson and Christian Walz. 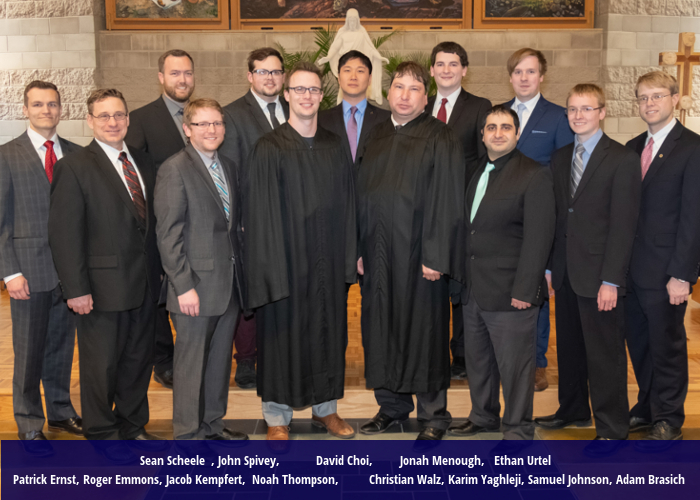 Noah Thompson was assigned as pastor of River Heights Lutheran Church (East Grand Forks, Minnesota), and Christian Walz was assigned as pastor of Good Shepherd Lutheran Church (Indianola, Iowa).